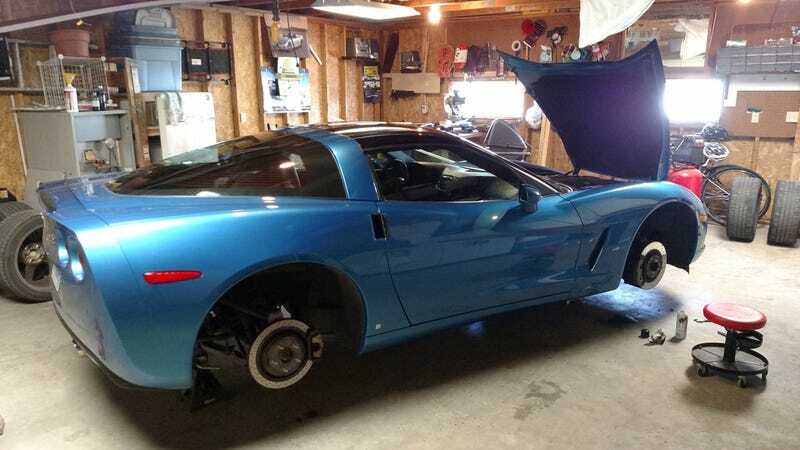 Some of this damage is from the factory assigned camber and toe in settings on Corvettes, most of this damage is from the lowering of the car. Originally I had planned to replace the tires this fall, for next season, now we’ll be replacing them this spring instead. When I bought the car I pulled the wheels/tires and there was very even tread wear, so that makes me think that they put a set of used tires on prior to sale, or they lowered it prior to sale and did not put many miles on after that. After being peeved at the previous owner for a bit I got back to work. The real reason I pulled the wheels/tires was to inspect the brakes, which I fully expected to need to replace based on visual inspection with wheels on. I was not disappointed, as seen in the brake shot. New pads and rotors are arriving this week, new fluid is already here and I have a mighty-vac so I can do a complete change of brake fluid (much needed). While in there I’ll be doing a pretty deep cleaning of all the suspension parts, oil change, rear-diff check and continue with the cleaning of the clutch fluid as described here: Ranger Clutch Care. More fun finds from the previous owner as I go, I’m sure.